Are the Corners Cramping Your Style? Allow our Corner Extra Vision Metal Framed Display Showcase to fix that for you. 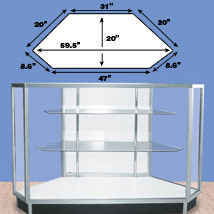 This enclosed glass display can be combined with the matching 48in, 60in, or 70 in. wide version to design a display system tailored to your premium products. 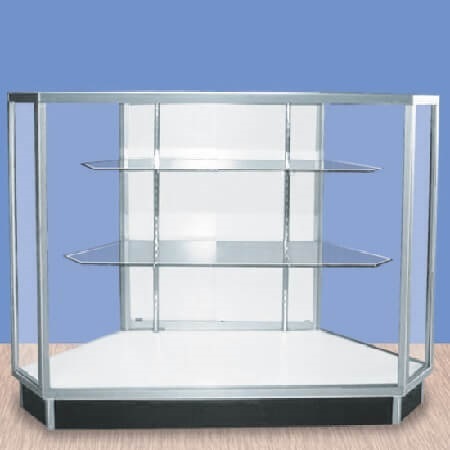 This retail display cabinet utilizes tempered glass with a thickness of about 3/16 inches and anodized aluminum frame with a white finished interior to create an elegant, yet durable product. The glass shelves are adjustable to fit odd shaped materials with ease. The top shelf is 10-inches deep while the bottom shelf is a little bit bigger at 12-inches deep. 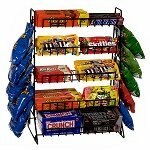 This retail fixture ships knocked down to save on price but it is easy to assemble. 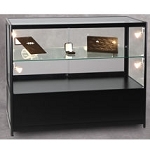 Order your corner display case today and start putting that wasted space to good use! Two Adjustable Glass Shelves With A Thickness Of 3/16"